Warner How To’s – Growing from Seeds | Warner Companies, Inc.
At Warner’s Nursery, we love this time of year. It’s not quite spring and our home gardens are mostly just plans in our heads. We’ll put the vegetable patch here, we think. Maybe we’ll grow some wildflowers in that section by the front walk. And this is the year we are finally going to get some nice strawberries going. All these horticultural ambitions start with the humble yet utterly amazing seed, that tiny packet of potential that can turn bare earth into flowering bounty. With a little care and commitment, seeds can bring the garden of your dreams into reality. Scientifically speaking, seeds are a flowering plant’s method of reproduction. Each seed contains an embryonic version of its parent plant and that embryo’s nutrient supply, all wrapped up in a protective coat. But how do you coax tomatoes, marigolds, nasturtiums, herbs and more from these powerful little specs? We can help. First, gather the right supplies. In addition to the actual seeds, you’ll need containers, soil and, eventually, fertilizer. While any container about two or three inches deep can be used, we suggest seed trays that make it easy and convenient to begin your project. 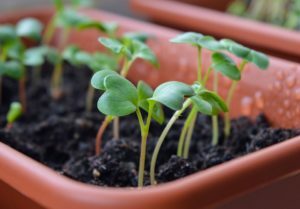 Resist the temptation to use dirt from your garden or recycle houseplant soil; seedlings need fresh soil. In fact, your best bet is to go with special soils like Black Gold Seedling Mix or Growell Seedling Mix (both available at Warner’s), which are specifically designed for seedlings. The benefit is the soil’s lighter weight – it makes sure that the seeds don’t retain too much water, which could lead to rot, and also makes it easier for the seeding to break through the soil once it germinates. Now get planting. Moisten your soil and pack it in your container or tray firmly to eliminate gaps. Check your packaging to determine if you should sprinkle your seeds on top of the soil or bury them. Give the planted seeds a little more water with a mister or small watering can. You might want to cover the seeds with plastic wrap or a plastic dome to keep that moisture in before they germinate, removing the cover when you see the seedlings start to grow. Once your plants have cracked their shells and you are seeing a little green, you’ll want to add some fertilizer to provide nutrients. Your seedlings will also need a lot of light. South facing window exposure is best or under a lighting system, but if you go that route, remember to not have the lights on all the time. Seedlings need darkness too so they can rest. Then it’s time to get them transplanted, but you will want to expose your seedlings to the great outdoors gradually before you move them into their final container or garden bed. One way to do this is to leave the seedlings out during the day and then bring them back in at night so they can adjust and “harden” to the elements. Warner’s Nursery would love to help you pick the right seeds and supplies to jump-start your garden, and we have lots of friendly staff with great advice on how you can successfully grow flowers and food from seeds.